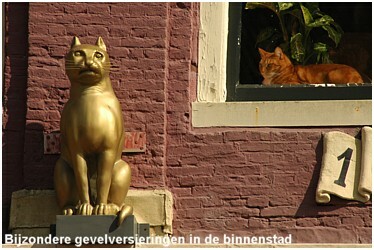 In Leeuwarden you have to look up. 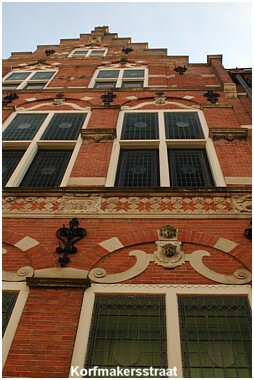 Above the windows of all the shops you will find beautifully adorned facades. These can sometimes inform you about how the buildings were formerly used. Tools, Greek Gods and animals, they all beautify the fronts of many old buildings. “Over de Kelders” is the street that has a lower part called “Bierkade” (Beerquay) a dock in the canal for unloading boats. 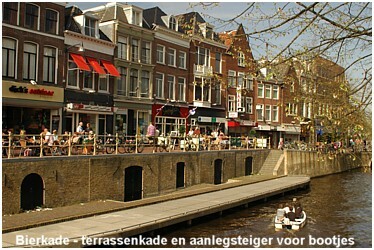 This is where you can now sit on a terrace and enjoy the canal and its surrounding houses. And where you can meet an historically significant person from Leeuwarden. CD "Confessions on the dancefloor"
Margaretha Geertruida Zelle was born in Leeuwarden. She became famous as exotic dancer Mata Hari in the uninhibited Paris at the turn of the century. The exotic dancer from Leeuwarden ended her life as a convicted spy. 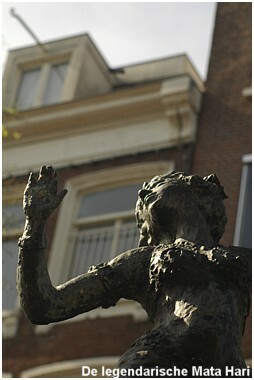 On this street a bronze statue made by the artist Suze Boschma-Berkhout resembles Mata Hari. In the Fries museum you will be able to learn all about Mata Hari. The inner city is full of small and narrow alleys and streets. In between the famous streets like Nieuwestad, Zaailand and Voorstreek you can find alleys with historical names like old professions or names that describe a rough sort of history here. Some of these alleys are just dead end streets and hard to find even for the locals (the ”Leeuwarders” or in city slang “Liwwadders”). The many bridges or as they call them here: “pijpen” (pipes) that connect the canals and streets together have all been restored. Their foundations have been enhanced and their walls have been grouted together according to the old masonry traditions. In the evening it looks very romantic because under the bridges blue lights are reflected in the water.